I’m the sort of person who likes to try things, to experiment. So when I read that I could grow a pineapple plant simply by cutting off the top and rooting it, I had to try it for myself. A couple of summers ago, I cut the top off of a pineapple and plunked it down in a raised bed among whatever else I had growing there. It rooted easily and in fall I dug it up, put it in a pot and brought it inside to live with my orchids. Pineapples are tropical plants in the bromeliad family, so I thought it would winter well under my orchid lights. The next summer, out it went again and then back inside for the winter. In Spring of 2013 I put it out in a planter by itself, as it had grown fairly large (about 2' in diameter) and I’d read that the third year was when I might expect it to flower. It’s Beginning To Look A Lot Like A Pineapple. The pineapple is continuing to grow up and out. It’s about 2" tall now and on a short stalk. The resemblance to a pineapple is clear. The red tips in the picture are the flowers. There is one flower for each pineapple section. Each section develops from an ovary and the fruits come together to form a single large fruit. 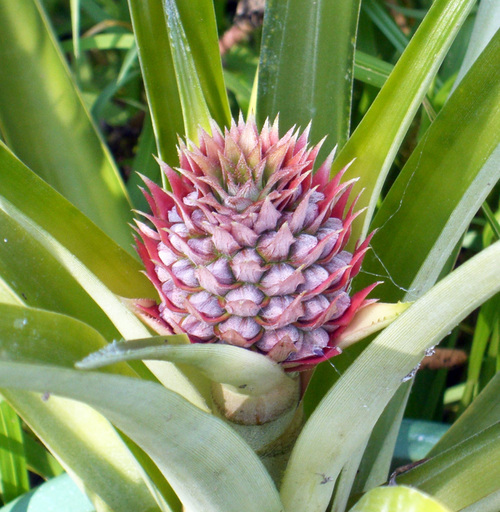 Pineapples, along with most bromeliads, are native to South America. They migrated up to Mexico and the Caribbean Islands where they were grown by the Aztecs and the Mayans along the way. After the Columbian Exchange (that massive exchange of people, plants, animals, and diseases following the discovery of the Americas), when people attempted to grow pineapples in Europe, they grew them in greenhouses or in pineapple pits, which consisted of three parallel trenches, with the pineapples in the middle trench and the outer trenches filled with horse manure. The trenches were covered with glass. Between the sun and the rotting manure, the pineapple plants had both enough heat and light to grow. Picture taken August 17, 2013. It’s Cold Outside! Now it’s the middle of October and the pineapple (along with my orchids) are inside and under a 400W HID (high intensity discharge) light. Because the light dramatically changes the color of the photo making plants an ugly shade of yellow-orange, I had to take this picture in the dark with a flash, which is why it looks a bit odd. But it’s clear the pineapple is developing. It now has a nice crown of leaves on top. It’s definitely smaller than the pineapple it came from—perhaps 3" tall. Clearly, the growing conditions are not ideal. Pineapples are usually pollinated by hummingbirds or bats. Hawaii has no native hummingbirds and bans their importation. The reason for this ban is to keep the Hawaiian pineapples from being pollinated. This does not prevent the growth of the fruit, but it does mean there will be will be none of the tiny black seeds. Pineapples that are seedless are produced though parthenocarpy, which means virgin fruit. Most plants do not do this in the wild and it seems that it would not contribute to their survival as a species. However, being able to produce seedless fruit when pollination is unsuccessful provides food for the animals that distribute the plant’s seeds. Without a fruit crop, the seed-dispersing animals might starve or move somewhere else. I have no idea whether or not my pineapple was pollinated. I’ll have to wait until it looks like it’s ripe and cut it open to see. It’s RIPE. I think. It’s definitely deep yellow, there’s a bit of give to the pineapple when I squeeze it, and it smells like a pineapple. 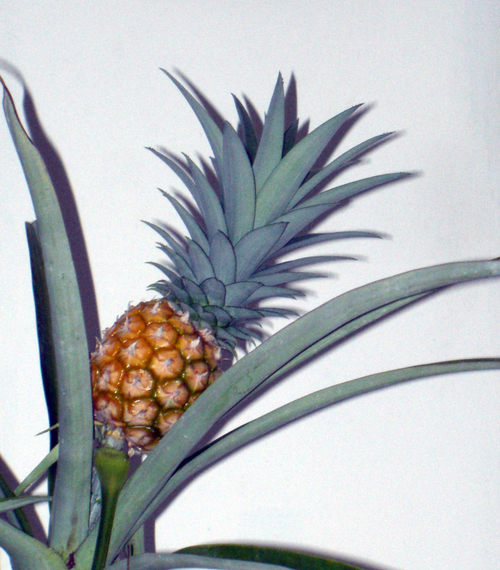 The plant appears to be tipping over a bit, which might mean that the stem holding the pineapple is weakening, which might be another sign of ripeness. I’m going to give it a try and hope I'm not too soon or too late. Pictures taken January 8, 2014. While cutting off the outside was a bit difficult (I didn’t want to lose more pineapple than I had to), the inside core was very small. I ended up with a small bowl of pineapple pieces—a bit more than I’d expected. There were no little black seeds, so my pineapple was not pollinated. There are humming birds around my yard, but I don’t see a lot of them. And then the final taste test. Just as sweet as the original! Amazing! The bowl of pieces didn’t last long—perhaps an hour of nibbling.